I was never aware I could “write”. I have always been able to articulate my thoughts and feelings very well, and have a reasonably good grasp of the English language (I was predicted two A* at GCSE level, which ended up being two A’s due to the addling effects of vodka), however putting my opinions into prose had never, ever crossed my mind. I also was never aware how interested I was in politics. I grew up in a household where the Morning Star was force-fed to me every day along with two rounds of toast and coffee, and shelf, after shelf after shelf of Marx, Engels, Trotsky et al peered, dog-endedly, through the plumes of tobacco smoke, inviting me to (even just briefly) peruse some of what they were trying to tell the world. Are the Brady Bunch hammering the public purse? I’m sure that I speak for the vast majority of West Ham fans when I say that the start of each season is met with an air of extreme trepidation. The feeling of anxiety in anticipating what is to come in the opening six weeks or so of any campaign is exacerbated if our first game of the season happens to be a home fixture. From a personal point of view, I can barely get through the hours leading up to the opening Saturday afternoon kick off without exhibiting a combination of cold sweats, nausea and nervous fidgeting. I can only compare the experience to my school days during the hours leading up to the time when my exam results would drop from the letterbox on to the hallway floor. The digital airwaves are full of it. After a rollercoaster ride for some months now any Labour Party supporter or member will have had their screens filled with it. The latest episode comes to my Facebook page via a former spin doctor and as usual consists of an article in a newspaper noted for its often relentless anti-Labour campaigning. This particular contribution comes from a Labour MP who complains with some passion that the 66 Labour MPs who voted with the whipped Tories to inflict high explosive bombing on Syrian communities are subject to ‘bullying’ that has been ‘unusual in its intensity’. Those of us who object to this futile gesture of machismo violence apparently ‘don’t really care about Syria’. To bomb is to care, it seems. The war no one quite knew how to stop. The consensus yesterday during the Syria debate was that Parliament failed to live up to the occasion. This was probably because the outcome was a foregone conclusion. Jeremy Corbyn’s free vote of Labour MPs ensured that David Cameron would have a majority at the end of the day. Britain was almost certainly going to war, yet not even the Prime Minister could explain why. Uncertainty radiated from both Tory and Labour benches. The cross-party Commons foreign affairs committee had delivered its negative verdict on the case for bombing. David Cameron’s hurried speech failed to convince sceptics on either side. He didn’t even convince many of his own supporters that there were 70,000 “free Syrian troops” waiting for our air cover before they took out IS or Daesh or ISIS (delete as applicable). On the eve of the Trades Union Congress a YouGov poll showed that the British public now oppose missile attacks by more than three to one. This is substantially up from two to one before prime minister Cameron was humiliated in the Commons vote and is a defeat for the shameful attempt by Blairites to ramp up the war drive. 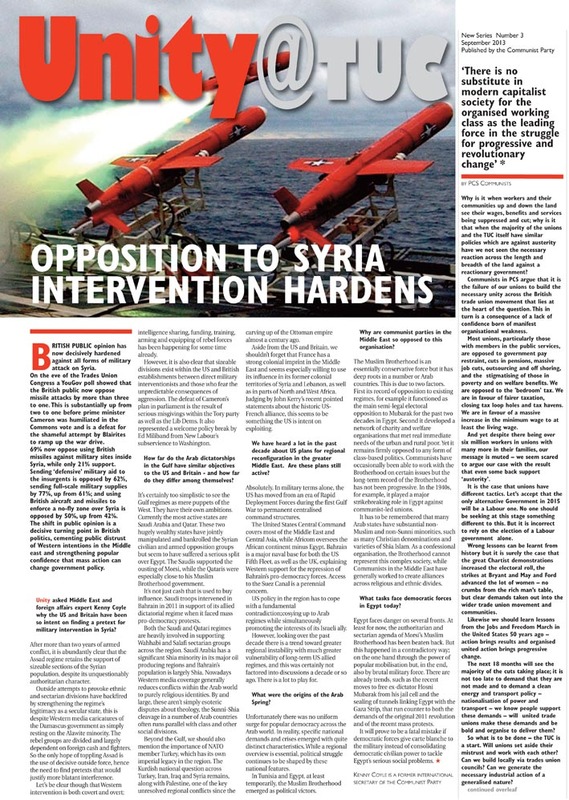 69% now oppose using British missiles against military sites inside Syria, while only 21% support. Sending ‘defensive’ military aid to the insurgents is opposed by 62%, sending full-scale military supplies by 77%, up from 61%; and using British aircraft and missiles to enforce a no-fly zone over Syria is opposed by 50%, up from 42%. The shift in public opinion is a decisive turning point in British politics, cementing public distrust of Western intentions in the Middle East and strengthening popular confidence that mass action can change government policy.